The room was very clean and comfortable - perfect for the two of us traveling together. We arrived very late on our first evening and the staff accommodated us and left instructions for the key. It's in a quiet part of the city about a 25-minute walk to all the tourist destinations but we enjoyed it. 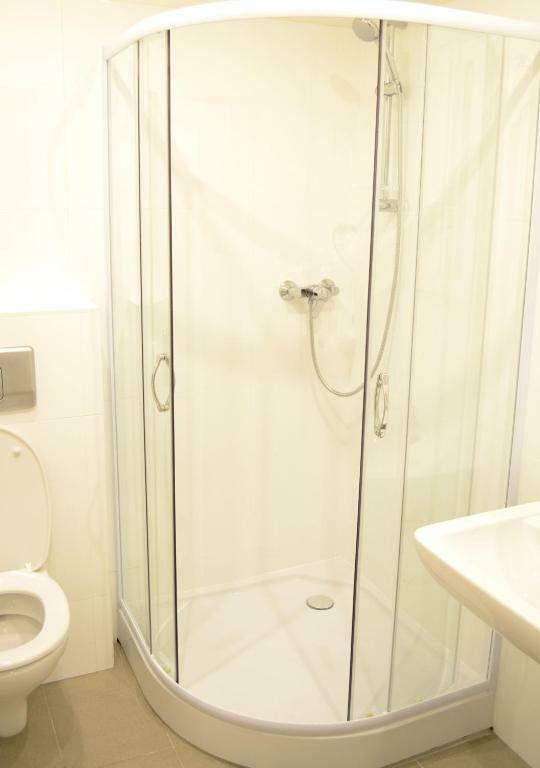 The property was nicely accommodated and very clear to be fair. It is close enough to the center, the best price I could find for New Years' weekend. Not far from City Center. Separate parking lots. Good Service. The location is perfect. Metro station is 5min walk from the property, and there is nice public garage, which is not cheap-about 22€ daily. The good thing is that if you have internet access and Viber, you can reach the property apart from working hours. We did not have-check what we didn’t like. It was a beautiful apartment! And the staff there for an hour. Super friendly and helpful staff. Clean, neat, and good location. Location is very quite though close to the center. It takes around 15 minutes by slow walking to be in old Vienna. There are two supermarkets just around the corner. Apartment is all equipped with kitchen things, the furniture is clean and nice. We were staying in October and it was pretty warm inside. Lock in a great price for Vienna Inn Apartments – rated 8.1 by recent guests! One of our best sellers in Vienna! 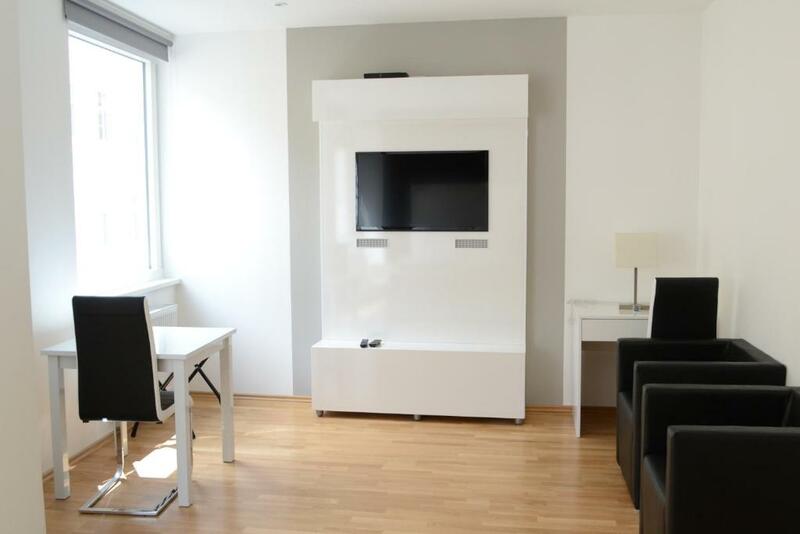 Located in the Leopoldstadt district, just an 8-minute walk from the Danube Canal, Vienna Inn offers contemporary accommodations with a kitchenette and a flat-screen cable TV. The picturesque Augarten is a 5-minute walk away. 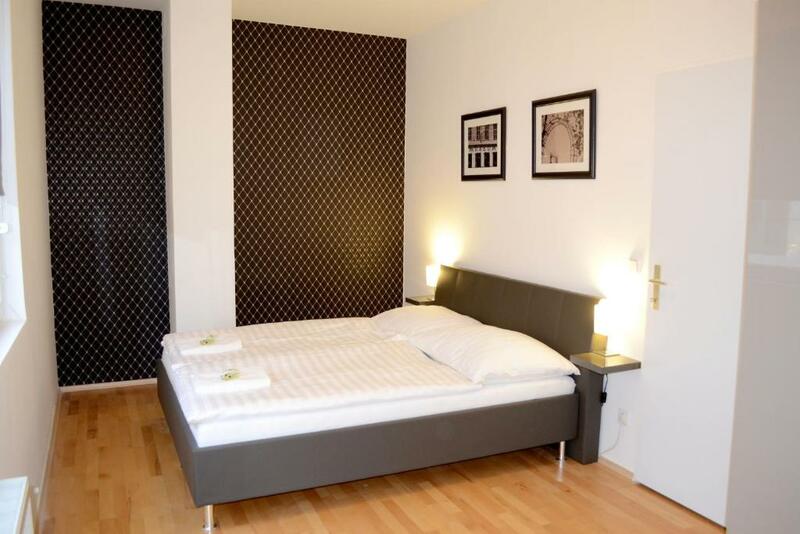 Several restaurants, cafés, bars and the Schottenring Metro Stop are within a 10-minute walk away. Malzgasse Bus Stop is a 2-minute walk away. The city center of Vienna can be easily reached within 15 minutes' by foot. Vienna International Airport is a 20-minute drive away by car. An airport shuttle service is available upon request. 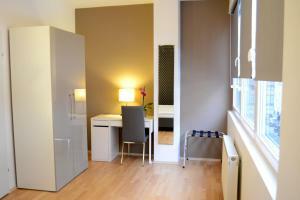 When would you like to stay at Vienna Inn Apartments? 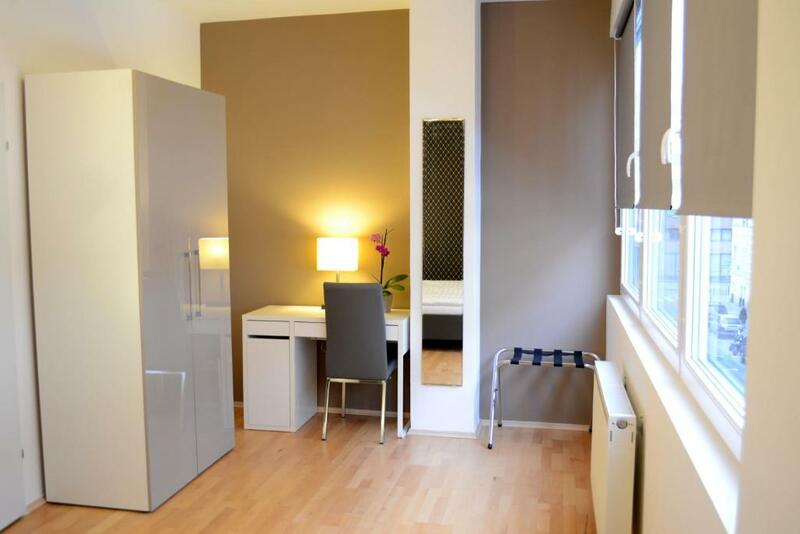 This stylish studio comes with a kitchenette and features modern décor and wooden floors. The kitchenette has a fridge and a stovetop, and each studio features a dining table and a modern tiled bathroom. Some studios come with a city or street view. They are accessible by elevator. This stylish apartment has a bedroom, a living room, and a kitchenette. It features modern décor and hardwood floors. The kitchenettes have a fridge and a stove. Each apartment features a sofa lounge, a dining table and a modern tile bathroom. Some apartments include a city or street view. They are accessible by an elevator. This stylish single room features a kitchenette and has modern furnishings and hardwood floors. The kitchenettes come with fridge and stove. Every single room has a sleeping area, a dining table and a modern tiled bathroom. Some single rooms have a view of the city or the street. They are all accessible with elevator. 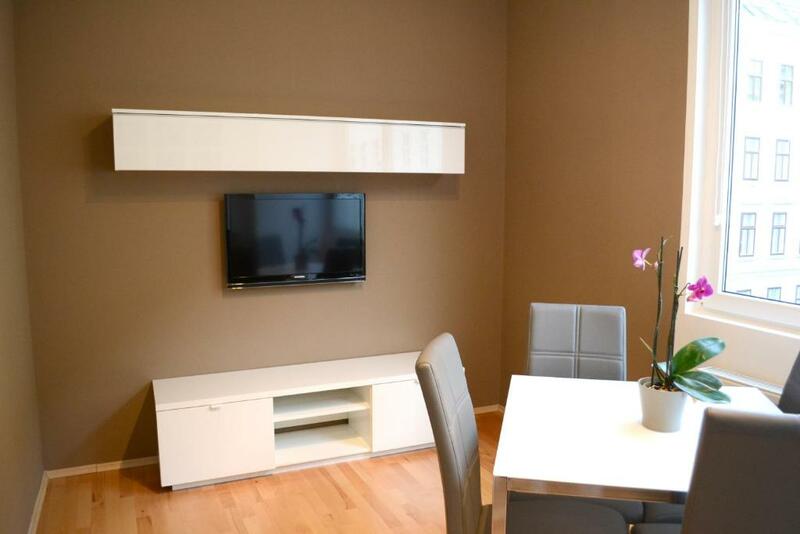 This apartment features a electric kettle, kitchenware and stovetop. This apartment has a cable TV, stovetop and kitchenware. 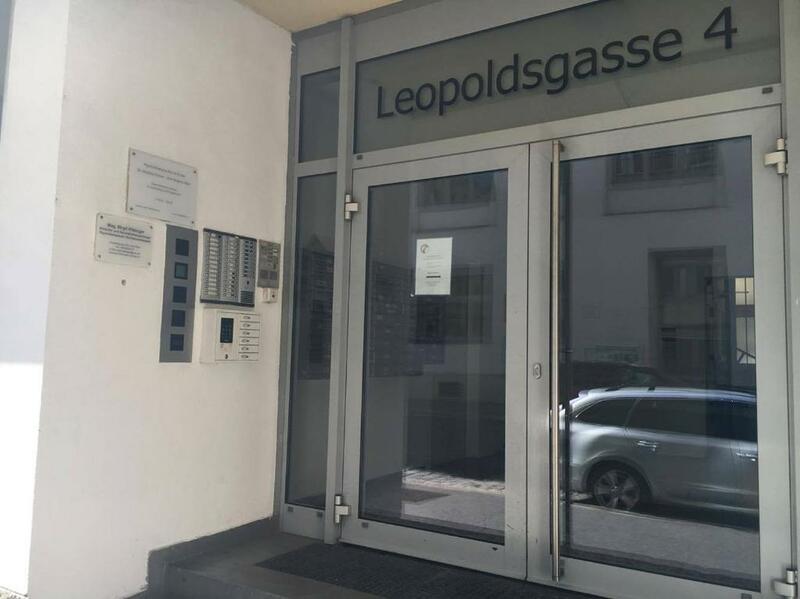 Ein angenehmer Aufenthalt in ansprechendem Ambiente, in einer zentralen Lage im Wiener- Innenstadtteil, die U-Bahnstation in unmittelbarer Nähe, Einkaufsmöglichkeiten durch gute Verbindungen, den berühmten Augartenpark, und den Altwiener Karmelitermarkt der Sie kulinarisch versorgt: das bietet vienna inn. House Rules Vienna Inn Apartments takes special requests – add in the next step! 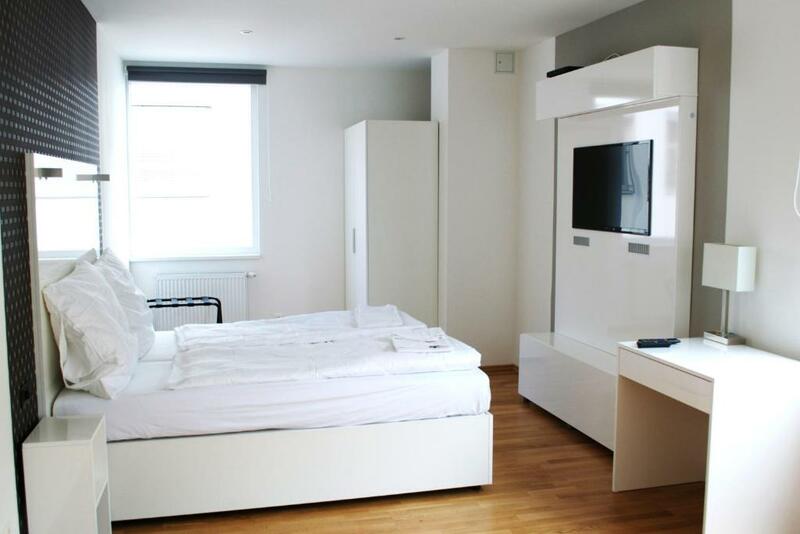 One older child or adult is charged EUR 25 per night when using existing beds. Vienna Inn Apartments accepts these cards and reserves the right to temporarily hold an amount prior to arrival. Please inform Vienna Inn Apartments of your expected arrival time in advance. You can use the Special Requests box when booking, or contact the property directly using the contact details in your confirmation. A bit of noise from above / neighbouring apartments from very early hours was slightly disturbing but nothing major. Walls are quite thin and the apartments face an elementary school, so a bit noisy sometimes, although nothing really bad. One of the door hinges of the shower was broken, but it all is minor stuff. A bit more maintenance on the appliances could help bringing it to the top level. Nice, clean apartment in one of the best locations in Vienna: plenty of non-touristy restaurants and coffee places and only 10-15min walking from Schwedenplatz and even less from the metro in Tabor Strasse. The apartment is not very soundproof when it comes to the street noise, and one can hear every car that drives by, like it were right next to you. That said, there is barely any traffic at night. But for people like me, who wake up quite easily, you only need a couple to destroy your night.. although I think it might not be a problem for 90% of the population... Otherwise, the apartment is quiet, did not hear neighbours or anything. There was a weird smell at the bathroom, from pipes I think, and the shower screen did not work very well. Shower had little pressure and the water turned ice cold on its own every couple of minutes. The bed linen was old and the pillow cases were torn. The cutlery was grubby and I had to wash it before use. There were no curtains and the blinds let the sunshine in early in the morning. Location was not so bad. Easy to get to the historical city centre. A lot of markets around. some issues with shower faucet. Nice place close to historical city center. Very big room. Apartment very worn out. Despite reporting that it is also dirty, the room has not been cleaned properly. The wardrobe was full of dust, which did not allow me to unpack my stuff. Would be just great if it was easier to set warm water in the shower. Also the flow in toilet sink was lame. Very spacy, beds are comfortable, kitchen is just fine. 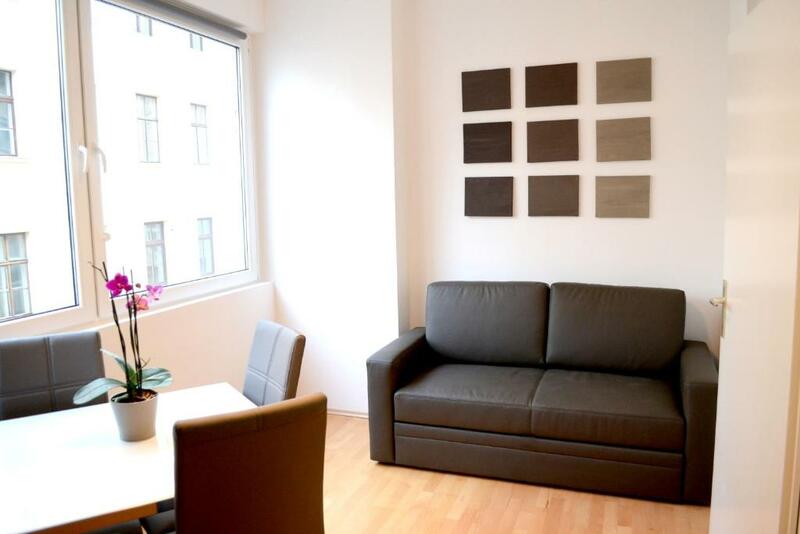 Location is great, few minutes to the metro and walkable distance from Stephanstplatz. The check in details wasn't clear enough for us that we arrived late. We send an email and never got a reply. There was a lot of light in the room from outside and that woke us up early every day. The beds need to be more soft. We liked the decoration of the room and the location was good. It was walking distance fron city center. The beds were comfortable, the apartment was more than suitable for purpose, was a resourceful way to convert an office block floor, the Vienna Inn Floor was the best and well secured floor. Could be a bit cleaner. Mainly the floor and the wardrobe. Simple apartment, had the basic necessities, the people at the reception were very friendly. Relatively close to the center. You need to take the metro.